While I'm not feeling much like writing these days, check out this post at Smithsonian's Food and Think blog: Thirty Years of Food in Music Videos. When I can't sleep, sometimes I try to compile a list of food references in music. Cheeseburger in Paradise, Pour Some Sugar on Me, Apples, Peaches, Pumpkin Pie, God Didn't Make Little Green Apples - how many can you think of? Lisa Bramen's post on food in music videos is a kick. Enjoy! Vacations create memories. Sometimes they recreate them. I ate my first red skinned new potatoes at the beach as a child. I drank my first Sprite from a soft drink machine at the beach years before it was available in the local grocery store. In my twenties, I accompanied friends to a conference at Myrtle Beach where most of the attendees were New Yorkers. We took them to a typical seafood restaurant one evening and ordered hush puppies. None of the New Yorkers had ever seen a hush puppy and asked, “Why would you eat donuts with fish?” They were soon initiated to the world of Southern food. I have eaten more than my share of hush puppies on this trip. And Southern fried fish as well. We randomly selected a restaurant named Mr. Fish here in Myrtle Beach. I ordered the fried shrimp and Larry chose the crab and crawfish cakes. Neither of us had ever eaten crawfish, but we both liked these cakes. They were fried – how could you go wrong! The hush puppies were divine; dense and sweet and perfectly crisp. I ordered the house special condiment, blackberry wasabi sauce for an extra 25 cents. It was great on the shrimp. It had a sweet initial flavor, followed by a serious wasabi kick. I need to do a lot of beachcombing to walk off all the fried calories from this week. As an impoverished college student, I didn’t have the funds to purchase a campus meal plan from the cafeteria. I ate a lot of oatmeal and beefaroni cooked in my popcorn popper that stayed hidden in my dorm room closet. But there were a few economical places that were favorites for dining out with friends on special occasions. One of those places was Bullock’s Barbeque in Durham. Every now and then, during my freshman year, girls from my dorm would pile into the cars of upperclassmen (freshmen weren’t allowed cars on campus) and head to Bullock’s for an early dinner. You had to be there by 5pm or suffer a long wait. And they often ran out of pie. We would order our pies first and insist that the waitress place them on our table at the beginning of the meal to ensure that we actually got them. I always ordered the combination barbeque and Brunswick stew plate, served with hush puppies and coleslaw. I think it cost about $4 back then. For years, I didn’t know if Bullock’s still existed. Then I saw an article about their barbecue in Bon Appetit magazine. Rejoice! So over the next few years, we tried to dine at Bullock’s twice, but they were always closed when we were passing through Durham to visit family. This trip, we were in luck. 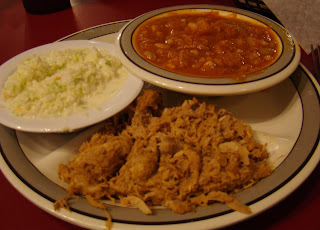 We landed in Raleigh on Saturday afternoon and my priority was to eat at Bullock’s before we headed to the beach. I skipped lunch in anticipation of our early afternoon dinner. There was no wait at 4:15, but by 5:30, the line was out the door. Some things never change. We both ordered my standard combo (now $7.80), even though the menu has greatly expanded in the last (almost) 40 years. Has it really been that long??!! They even serve quesadillas now, which I had never heard of in 1972. I must admit it wasn’t as amazing as I remembered, but I thoroughly enjoyed the nostalgic experience. We were too full for dessert, but for old time’s sake, I had to order pie just to see if they had it. We split a slice of chocolate chess pie, a Southern specialty. I won’t need to eat again for days. 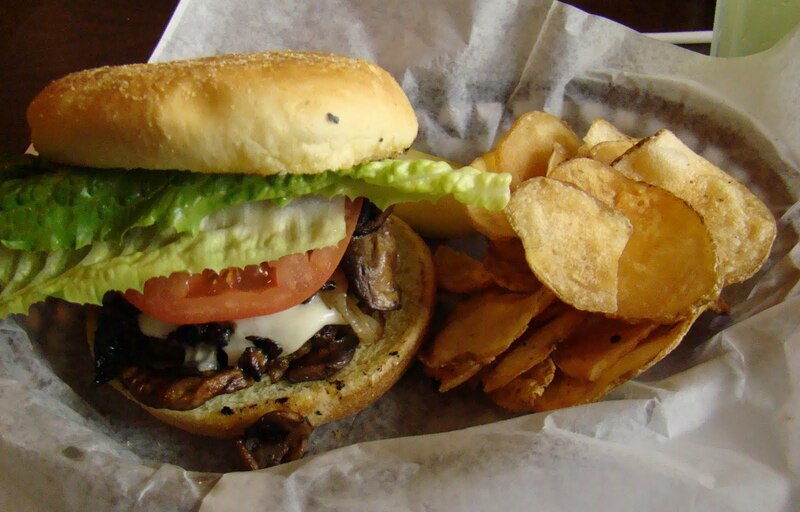 Nothing beats a good burger. Or good friends. We’ve spent this week in the Adirondacks with friends from long ago. We met them through a couple who were mutual friends back when they first moved to California in 1986. I was instrumental in connecting her with her California job, so we were off to a good start. The six of us spent a lot of time together over the next three years before they headed back to the East Coast for career reasons. They moved around while the rest of us stayed put, but we always stayed in touch and sometimes vacationed together. Thirteen years ago, she and I discovered the lifeless body of our beloved friend who had introduced us. She had lost her battle with breast cancer. The sudden death was traumatic to us all. We all huddled with our friend's husband and family for the next week, stunned and distraught, grieving together. We never talk about that week now. But we remember the good times. It’s hard to believe it’s been nine years since we’ve seen such dear friends. We have certainly aged and three more of us have battled cancer. So far we are winning. This week we have enjoyed hiking in the forest, swimming in the icy waters of Lake Champlain and watching the ever-changing character of the lake from our porch. We have laughed at each other’s jokes (both good and bad), caught up on our stories and languished in comfortable silence. For our final dinner together, they chose their favorite vacation burger joint. I chuckle to think they were worried we would not find the Bay View Diner fancy enough. We’re the ones who eat street food in third world countries. In Peru we dined on dried potatoes tossed on a blanket in the dirt when offered by an indigenous tribe in the highlands. A burger joint is pretty high class in comparison. And the burgers were top notch; served with Adirondack fries – sort of like warm potato chips. But nothing beats sharing the burgers with the people you love. Heirloom tomatoes symbolize summer. But this year, like all the other summer produce in Northern California, the tomatoes are late. We’ve had none of our usual Sunday lunches composed of at least six varieties of tomatoes. But on our last trip to the farmers’ market we purchased one large Purple Cherokee tomato at an exorbitant price. I just couldn’t resist. 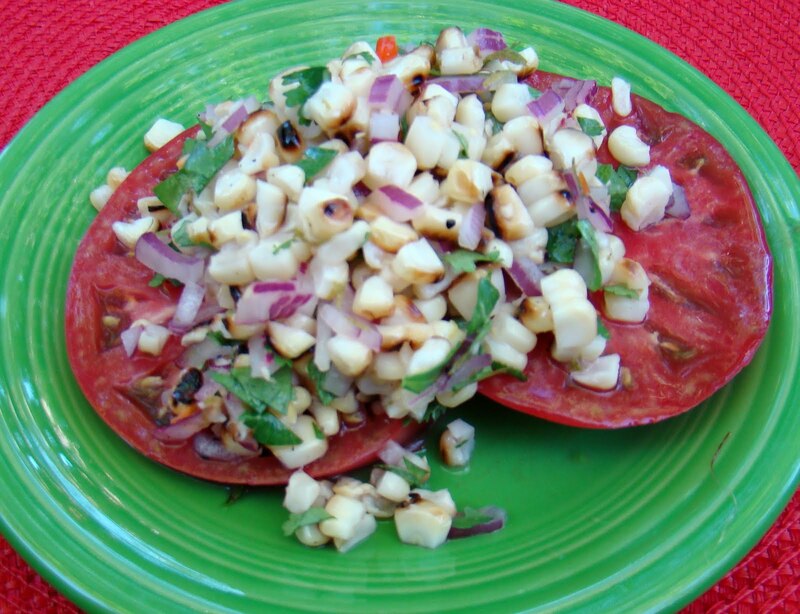 To make up for the lack of tomatoes, I substituted our other summer favorite, Brentwood corn, and tried this recipe from the San Jose Mercury News, “Corn Ceviche.” I thought you needed fish to have ceviche, but in spite of the misnomer, it looked like a good summer vegetable dish. It doesn’t get much easier or tastier. Grate the zest of the lime then juice the lime. Mix the lime zest and juice with the grilled corn kernels, onion, chile, cilantro and oil. Salt and pepper to taste. Serve the corn over slices of the heirloom tomato. We are currently resting our minds and bodies lounging by Lake Champlain in the Adirondacks with dear friends. Yesterday I spent the afternoon watching the leaves dance in the wind over the water. This is a much needed break before I return to civilization to visit family, then back to begin maintenance immunotherapy and wrap up my last weeks of work. Although we continue to cook and eat, I’ve been unable to focus on writing lately. The accumulation of almost 18 years of papers, emails and files need to be sorted and dispositioned as I prepare to leave my job (and maybe my career). I’m contemplating what I might do next. I have been concerned with illness and tragedy in the lives of my family and friends. And I’m faced with preparing for a whirlwind vacation from West to East where we’ll visit both family and friends, staying 8 different places in 17 days. I’m tired just thinking about it. Last night we entertained friends for dinner. The meal was a resounding success, even though every item on the menu but one was a first time recipe. I’ll start with the dessert since that’s the only photo I took. I wanted something light for a summer evening, but decided on gelato too late to make it ourselves. 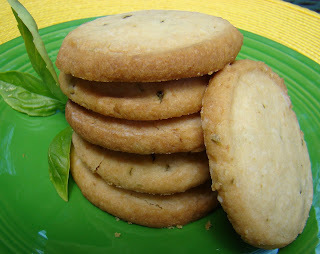 We purchased limoncello gelato, but I did make these shortbread cookies. I served the gelato with a splash of Kim of Liv Life’s homemade limoncello on top, along with the cookies. 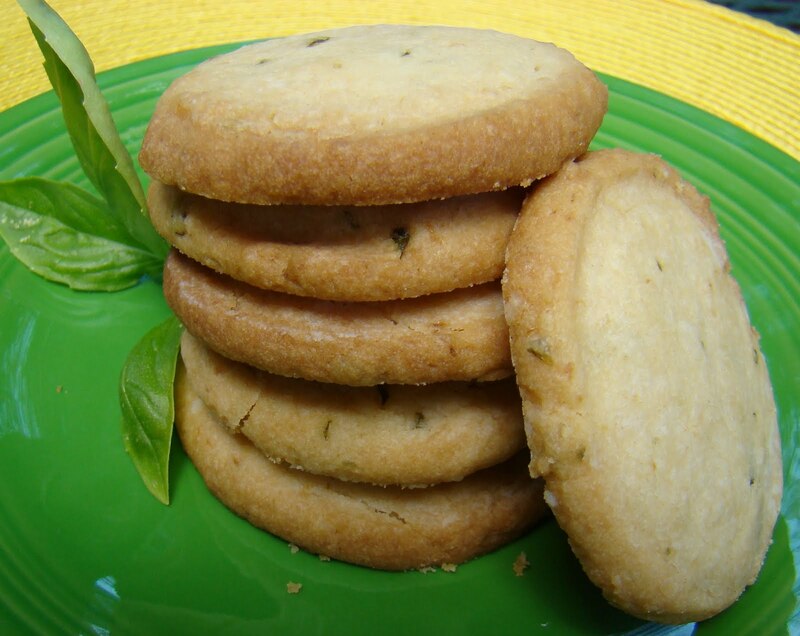 One guest requested a cup of tea after the gelato and polished off most of the rest of the cookies. Need I say they were good???!!! And really easy to make, too. Preheat oven to 375 degrees. Place ingredients in food processor and pulse until large, moist clumps form. Measure tablespoonfuls of dough and roll between your palms to form balls. Place on a large baking sheet, 2 inches apart. Lightly dust the bottom of a flat measuring cup with powdered sugar and press dough balls into flat 2 inch rounds. Bake until edges are brown, about 20 minutes. Transfer to a wire rack and let cool. It was fun planning a menu for people who don't like salmon, cheese, spicy food, and can't eat nuts or fruit. These are the staples or our regular cuisine. For appetizers we had garlic shrimp, steamed artichokes and La Brea rosemary bread with a garlic wine dipping sauce accompanied by La Honda Sauvignon Blanc. The main course was skewers of grilled chicken with mint and red onions, Greek salad of tomatoes, cucumbers and Feta cheese (on the side) with tzatziki and fresh pita bread. A second bottle of sauvignon blanc was consumed; this time we chose Kendall Jackson. Maybe soon, life will become more normal.